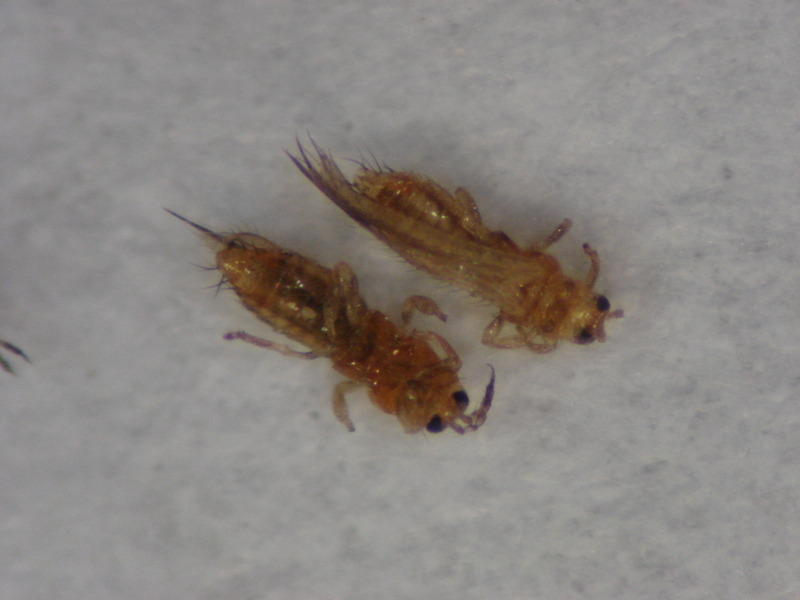 Pest description and crop damage Adult western flower thrips (WFT) are very small (about 0.04 inch long at maturity), slender insects with fringed wings. They are generally white when young but brown or black when mature. Larvae are very tiny and difficult to distinguish without magnification. Pear thrips are also very small (0.07 inch at maturity). Adults of these insects are perceived as mere black specks when observed on foliage. Adult pear thrips have two pairs of wings, but are weak fliers. Consequently, dispersal by adults from one infested area to another may be attributed to wind currents. The larvae have red eyes and are pale cream to translucent green which makes them difficult to observe on host foliage. Larvae sometimes congregate in groups on the foliage which makes them more conspicuous. Female western flower thrips lay eggs in the developing fruit causing a small oviposition scar surrounded by a pale area. In recent years, WFT feeding has been implicated in causing superficial silvery rings where cherries touch each other, especially on late cultivars such as Lapins or Sweetheart. It usually shows up 3 to 4 weeks before harvest, when vegetation surrounding cherry orchards dries up, forcing thrips adults to disperse and move into orchards. Control thrips when adults begin to disperse into orchards of the late-season cultivars. A tentative threshold for controlling thrips at that time is five or more per beating tray. Feeding by pear thrips causes blasting of buds and ragging of foliage. This pest has recently become a localized problem in the Hood River fruit-growing area, especially in orchards that border habitat with native hosts such as maple and other deciduous trees. Biology and life history Western flower thrips overwinter as adults in ground duff. In the spring, they seek out flowers where they feed on pollen and nectar and lay eggs into floral parts. The larvae feed on flowers, buds and leaves. When mature, the larvae drop to the ground and pupate. The adults that emerge may lay eggs on developing fruit. Under favorable conditions, a complete life cycle may be completed in two weeks. There are several overlapping generations per year. Seasonal migration occurs at various times of the year due to destruction or drying up of host plants, and adjacent crops may be invaded by these insects. Thrips eat pollen and nectar on a wide range of plants (at least 244 species from 62 families). Pear thrips are a native of Europe and have been a pest since the early 1900s not only on tree fruit, but on an array of forest trees. This pest spends most of the winter as an adult female in the soil. Adults emerge in early spring and adults disperse to a suitable host and crawl beneath a swollen bud scale to feed on immature tissue, which they can extensively damage. Eggs are laid soon after a suitable host is located. Following egg hatch, the larvae continue to feed while the adult thrips die off. The larvae drop to the soil in late spring and prepare to overwinter. Scouting and thresholds Use a beating tray during pink stage to monitor and detect immigrating pear thrips or as late season cherries begin to ripen for western flower thrips along border rows of orchard. Avoid disking the orchard floor during bloom or mowing cover crop prior to harvest if thrips are numerous on orchard floor vegetation. Pear thrips are best controlled at early pink. imidacloprid-Soil drenches may have residual activity in woody plants lasting for 12 or more months. If short-term management is the goal, consider other approaches-Highly toxic to bees..
spinosad-Toxic to bees. Some formulations are OMRI-listed for organic use. spinetoram (Delegate WG) at 4.5 to 7 oz/a. PHI 7 days. REI 4 hr. Apply no less than 3 days apart for thrips, with a maximum 4 applications per season. Control may be improved by addition of an adjuvant to the spray mixture.